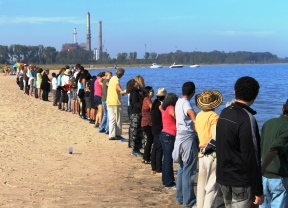 Local public officials with the help of environmental justice organizations gathered onto Waukegan lakefront near NRG Energy’s coal-fired power plant to celebrate the release of the Obama Administration’s first national carbon pollution protections. The Clean Power Plan allows each state the opportunity to develop its own plan to reduce carbon pollution from power plants and ramp up clean energy. The gathering was hosted by The Clean Power Lake County Campaign. The NRG plant was named one of the nation’s worst environmental justice offenders in a 2012 NAACP report. 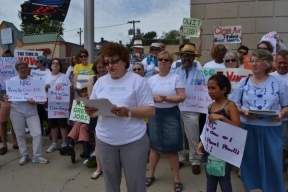 The Clean Power Lake County Campaign urged public officials for years to plan a conscientious transition away from coal to secure clean energy opportunities in Lake County. The Clean Power Plan help creates urgency and affirms those calls to action.